Apologies to you Gladiator fans. Marcus Mettius may or may not have been a trader in real life. In Julius Caesar’s masterpiece, Caesar’s Commentaries: On The Gallic War and On The Civil War, he only mentions Marcus twice, once to point out that he sent him as ambassador to the German king Ariovistus because Marcus “…had shared the hospitality of Ariovistus.” Sounds like a salesman to me. In Caesar’s Ambassador Alex Johnston proves that history can be humorous even when it’s dramatic. This short story takes place during Caesar’s conquest of Gaul. 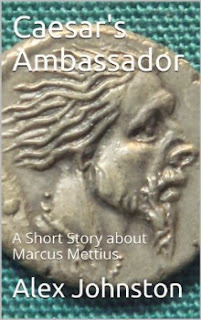 Marcus Mettius is a trader who follows the army around, making great deals along the way. Then, one day, Caesar unexpectedly sends him, together with his Gallic interpreter Gaius Valerius Troucillus, to the German King Ariovistus as ambassador. Although scared (Ariovistus isn’t a particularly nice guy), he has no choice but to obey. Gaius tries to reassure him: “I don’t know why you’re so worried, Marcus. Everybody knows that harassing ambassadors is against the rules. Anyway we treated his messengers like kings. Anyway your friends with the guy, Right?”. Next thing you know, they’re taken captive and left to witness a soothsayer perform a ritual that will decide whether they will be burned at the stake or be granted one more day of life. And yet, throughout this ordeal, Marcus never loses his wits nor his humour. He’s a salesman through and through, always looking for an opportunity to turn a bad situation into a profitable one. Will he succeeds this time? You surely hope so. Marcus is a very likable character, and one well-developed too. It is no easy feat to create three-dimensional characters in the short space a short story allows you, but Johnston does a great job at it. The story is neither too fast nor too slow paced, but the humour that pervades it thoroughly always keeps it entertaining and funny. The characters all talk using modern slang, which can make the story a little anachronistic. And yet, here it works very well. It just enhances the story, and makes it more accessible to modern readers, even those who dislike historical fiction and think it is boring. This little story certainly isn’t. It will have you laughing from beginning to end. Caesar’s Ambassador by Alex Johnston is a funny short story about Marcus Mettius, a trader who becomes an ambassador for Caesar. The characters are well-developed, the anachronistic modern writing style fits the story perfectly, and the pace is good. Overall, it’s a humorous read that will have you in stitches.